Millions of dedicated viewers know Les Stroud as Survivorman: the nature-loving, joke-cracking, critter-eating, odds-defying star of the television program of the same name. As Survivorman, Stroud has braved the elements in some of the harshest — and most gorgeous — places on earth, filming himself and his struggles as he takes on Mother Nature in its most ferocious forms. Stroud’s adventures are compelling viewing and the show has been broadcast in Canada and internationally on the Discovery, Science and Travel Channels for 16 years. As if that isn’t enough, Les is also an accomplished musician. He tackles songwriting and performing with the same single-minded dedication that has been the hallmark of his award-winning television show. Just as Survivorman demonstrates Stroud’s respect for the outdoors, his songs celebrate the power, vastness, beauty, and increasing fragility of the planet we inhabit. Les calls his musical style, Earth Music, songs with a purpose, written to raise consciousness about the mounting ecological challenges of the 21st Century. “Arctic Mistress”, Stroud’s latest single and the first song released from his upcoming 2017 album, is both a celebration and a warning. Over an exciting and seductive song, Les reminds us that this remote and frozen part of the globe is rapidly warming — and the consequences of the thaw will be felt far beyond the Arctic Circle. Stroud is never didactic, but he is insistent, and he has every reason to be. He’s an explorer with first-hand knowledge of these Polar Regions, and he’s determined to share what he’s learned with the rest of the world. Much like an episode of Survivorman, the video for “Arctic Mistress” features stunning footage of the Earth’s natural wonders; mammoth icebergs, titanic glaciers, and great snow-covered mountains. This is the Arctic, imposing and impressive, and Stroud’s love for it is palpable. But it is also a region undergoing dramatic change, and Les asks whether the ice caps will themselves survive. In one dramatic sequence, a wall of ice, weakened by warming, collapses to the sea in a cloud of water vapor. The implication is clear: Is this the fate of the Arctic and perhaps the entire World if we fail to act now with courage and urgency? Here at HIP we are ecstatic to have the opportunity to work with Les Stroud and bring his unique talents to viewers everywhere. Les is a man of action who is able to convey this critical message with his considerable musical talent. We’ve never experienced anything quite like “Arctic Mistress” and we’re confident that you will find it as beautiful and inspirational as we have! For more info please contact Andy Gesner and the HIP Video Promo team at (732)-613-1779 or email info@HIPVideoPromo.com. 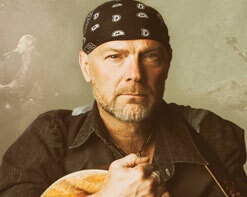 You can also visit www.Facebook.com/theRealLesStroud or www.Twitter.com/RealLesStroud for more info on Survivorman – Les Stroud.